There have been many biopics involving the life of the legendary Bruce Lee. This film is probably one of the most dramatic and in some elements, accurate historical depiction of Lee’s early years before breaking ground as the Dragon we know him as today. During a tour of a Chinese opera performance in San Francisco, Lee Hoi-Chuen and his wife, Grace Ho, became the proud parents of their fourth child, who is named Bruce. Upon their return to Hong Kong, Lee’s grandmother gives Bruce the nickname “Phoenix”, to warn off the demons. Bruce enjoys his early years causing trouble and at the age of ten, makes his lead film role in the film “The Kid”, with director Fung Fung giving Bruce a new name: Lee Siu-Lung. Flash forward to Bruce as a seventeen year old, where he is living the life of a teenager, all with causing trouble by unexpectedly getting into fights. He has his friends Kong, Skinny, and Unicorn. A young girl, Margaret, who is also an actress, has eyes for Bruce. However, Bruce soon meets Pearl, the daughter of famed actor and family friend Tso Tat-Wah. Too shy to reveal his feelings, he learns that Kong has begun dating Pearl. Meanwhile, Bruce finds himself victimized somewhat by British school boxer Charlie Owen. Bruce begins his training in Wing Chun, and works hard. Meanwhile, a chance to enter a Cha-Cha competition finds himself unexpectedly torn between Pearl and Margaret. After Kong learns how Bruce liked Pearl, he is upset and ends up in a bad predicament. Going missing, Bruce must clear all obstacles both personally and emotionally as his life will soon change forever. Many are probably thinking right now, haven’t we seen enough Bruce Lee biopics? There have been films like Bruce Lee and I (1976), Bruce Lee: The Man, The Myth (1976), and Hollywood’s take, Dragon: The Bruce Lee Story (1993), which was seen through the eyes of Bruce’s widow Linda Lee Cadwell. However, this biopic revolves around Bruce’s early years from his birth to the age of eighteen. Here, the film is seen through the eyes of Bruce’s little brother Robert, who not only narrates the story, but introduces the film with his sister Agnes. The central character of Bruce himself is played by four different actors. Li Yang plays baby Bruce, Liang Rui as 3-year old Bruce, and Peng Geng as 9-year old Bruce. The role of the elder teenage Bruce is played quite well by Aarif Rahman, who somewhat resembles Bruce and channels his energy. Tony Leung Ka-Fai is wonderful to watch as Bruce’s very stern and opera performer father, whose addictions catch up with him and nearly causes the family to get in serious trouble while Christy Chung channels Grace Ho as the very concerned motherly figure. Kudos goes out to young Dylan Sterling, who kind of brings laughs when it comes to playing young Robert, Bruce’s little brother. Jennifer Tse, the sister of Hong Kong pop icon Nicholas Tse, makes a decent film debut as Pearl, the girl who Bruce longs for, but is afraid to tell her out of respect for his best friend. Zhang Yishan, Ou Yang-Ching, and Tan Hanjing, for the most part, look like they are enjoying themselves as Bruce’s most trusted confidants. Their chemistry has the feel of 1950’s Hong Kong and it is quite interesting to see Bruce in a light that isn’t the typical kung fu jive. The film’s depictions of important events of Bruce’s life is nicely shown, including the Cha-Cha championship he won with a very unlikely partner. That doesn’t go without saying that the film isn’t all drama. What is a Bruce Lee biopic without some sort of action? The film’s central fight scenes involve Rahman’s take on Bruce taking on Alex Yen’s Charlie, the British boxing champion. The first is a boxing match set in a ring, but the rematch is a no holds barred match in a warehouse that somewhat emulates the classic Lee vs. Chuck Norris fight of Way of the Dragon with the appearance of a cat, the fighters practicing before the fight, and the music, which is a modernized update of that movie’s theme. The credit goes to Chin Kar-Lok, the film’s action director, on a good job with these two fight scenes. Those expecting a Bruce fight at the end of the film will be sadly disappointed but the scene proves vital as it determines Bruce’s fate. 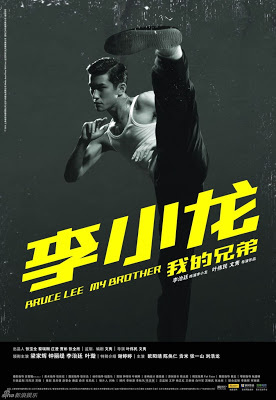 Bruce Lee: My Brother is actually a really good representation of Lee’s early years, with help from a driving performance by Aarif Rahman as Bruce, a great supporting cast, and some actual historical representations of certain events. If you are a Bruce Lee fan, this is one worth taking a look at. Media Asia Films presents a Shanghai TV Media/Beijing Antaeus Films/Beijing Meng Ze Culture and Media/J-Star Group production. Directors: Raymond Yip and Manfred Wong. Producers: Robert Lee, Manfred Wong, and Lorraine Ho. Writers: Manfred Wong, Lau Ho-Leung, and Joyce Chan. Cinematography: Jason Kwan. Editing: Azrael Cheung and Shirley Yip. Cast: Tony Leung Ka-Fai, Christy Chung, Aarif Rahman, Jennifer Tse, Angela Gong, Zhang Yishan, Ou Yang-Ching, Tan Hanjing, Dada Lo, Leanne Ho, Charles Ying, Dylan Sterling, Alex Yen, Wilfred Lau, Cheung Tat-Ming, Eddie Cheung.